Well, I said I was going to post and stitch more in the New Year and that really hasn't happened. Things have been kinda stressful around here because we've been house hunting. We found one that would be perfect for us - it has a great yard for the boys and lots of room inside. We are negotiating for it right now, so my stomach is in knots! I got a new pattern in the mail today too! It's Frances Pool by With Thy Needle & Thread. I was thinking of stitching it on 40 ct. Lt. Examplar. 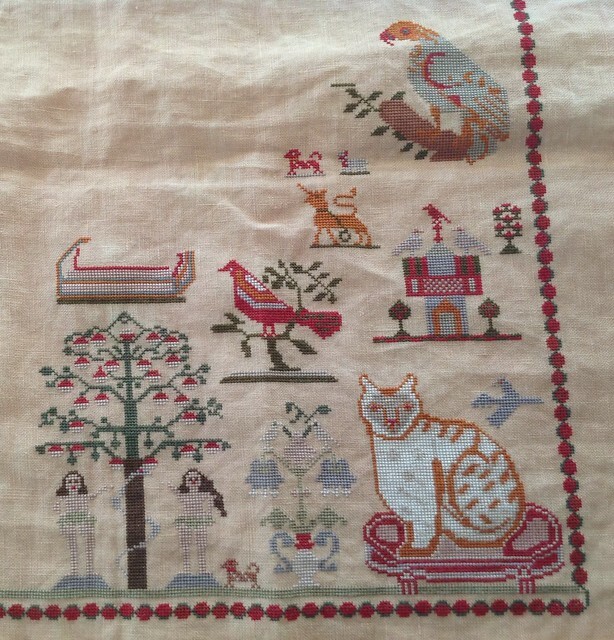 I think it's such a pretty sampler! Well, if everything works out with the house, we'll be closing at the end of next month! It will be here in no time - I have to start thinking about getting everything packed again! Your two WIPs look great. 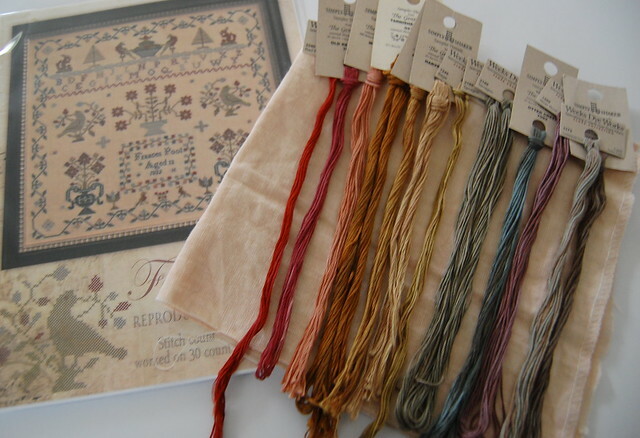 Love the colours on your new sampler. Good Luck with the house. 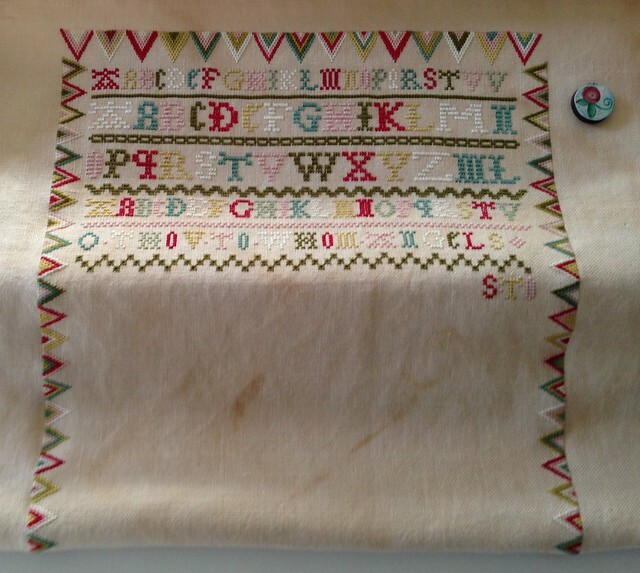 Very nice progress on both samplers - they're gorgeous. Best of luck on the house deal, I'll keep my fingers crossed for you all. Beautiful WIPs, Nicole! Love Frances Pool the more I see her. Fingers crossed on the house! Beautiful work on both projects and your new one looks wonderful! Love the colors in Ruth! Both are looking wonderful! Charlotte, Ruth look stunning and Frances...gonna be great! All gorgeous projects!!!!!! Lots of good thoughts all the house stuff works out perfectly :-). Best of luck on your new home! I'm sorry you're having to go through the stress of it though. Beautiful beautiful projects!! Good luck with the house ~ sending good thoughts your way! House hunting can be stressful, that s for sure.... I hope everything goes as planned and you will be in your new place soon..... Love your stitches too!!!! Love your stitching. And new stash. Beautiful progress pics. Dang, now I want Frances Pool! LOL Thanks for showing that as you can't really tell the colors on the pattern. Best wishes to you on finding house! Very exciting! Finding the perfect house is a real feat; waiting for the red tape is the harder part! Wishing the best for you! Beautiful stitching, as usual. Ruth Bacheler has such *great* colors. I think I say that every time you bring it out! Good luck with the house.